We invite you to our FORTNIGHTLY Men’s Group. Come any (alternate) Tuesday evening 7.15 for 7.30 start, finishing at 9:30. Meetings for 2019 start on Tuesday 22 January. The following meetings will be: 5, 19 February; 5, 19 March; 2, 16, 30 April; 14, 28 May; 11, 25 June; 9, 23 July; 6, 20 August; 3, 17 September; 1, 15, 29 October; 12, 26 November; and 10 December. We meet at 357 Gloucester st (better known as the home of Canterbury Men’s Centre). A $5 donation would be appreciated. 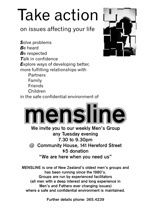 Mensline is an open men’s group running every Tuesday night and any man is welcome. Christchurch Mensline provides a place where men can express their thoughts, feelings, fears, problems, and dreams. Mensline supports men’s growth in their various roles in society. Please be on time, no late comers. At Avon Loop Community Cottage, 28 Hurley Street (Near the intersection of Barbadoes/Kilmore St). Christchurch Mensline provides a place where men can express their thoughts, feelings, fears, problems, and dreams. Mensline supports men’s growth in their various roles in society. to provide a place where men can express their thoughts, feelings, fears, problems, and dreams. Mensline supports men’s growth in their various roles in society. Mensline is back to the central city!